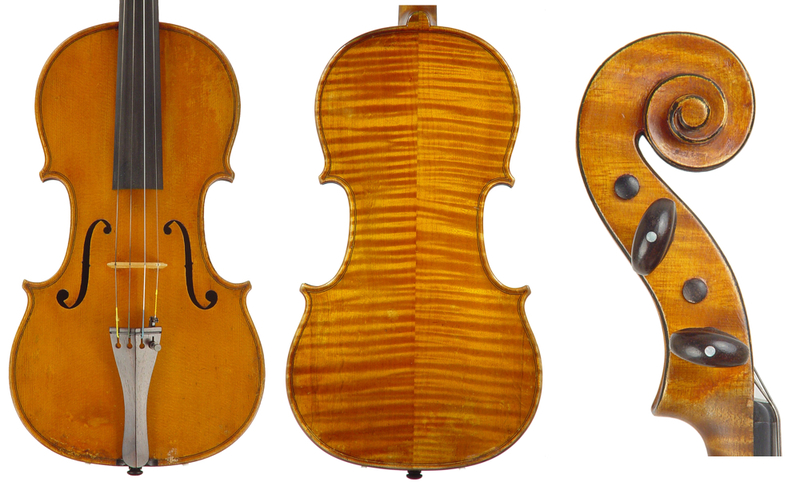 George Gemünder was the second son of the violin maker to the court of Prince Hohenlohe, Johann Georg Gemünder. The family lived and worked in Inglefingen, in Württemberg, western Germany. George (originally Georg, 1816–1899) and his elder brother, August Martin Ludwig (1814–1895), worked with their father, while Albert (1819–1885), the youngest, studied organ making. After their father’s death in 1835, George worked in shops in Pressburg, Vienna and Munich, while August took over their father’s shop, moving it to Regensburg in 1839. George arrived at the workshop of J.B. Vuillaume in Paris around 1843. He learned quite a bit from Vuillaume during his three-year apprenticeship, repaired some great violins used by the virtuosos of the time and became friendly with famous musicians such as Ole Bull, Louis Spohr and August Wilhelmj, although he appears to have been too egotistical to get on with his co-workers: in his unfailingly self-aggrandizing autobiography he refers to their jealousy of his swift progress. In 1846 August and Albert emigrated to the USA, where they opened an organ and piano building company in Springfield, Massachusetts. They urged George to join them, which he did in 1847, and the three brothers embarked on a performing tour with a fourth musician (their quartet consisted of a clarinet, a violin, a flute and a bass guitar). According to George’s autobiography they were lauded wherever they played but their manager took all of the concert proceeds and the quartet soon disbanded. Afterwards Albert and August returned to their factory in Springfield, while George settled briefly in Boston. In 1850 George moved to New York, and the following year he learned that the quartet of instruments he had sent to the 1851 Grand Exhibition in London had won the first prize. This news jump-started his career as a violin maker in the USA; he later claimed to have won first prize in many exhibitions into which he had never entered. Bull, Spohr, Wilhelmj and other virtuosos he had met in Vuillaume’s shop patronized Gemünder in New York, and he capitalized on every bit of publicity that he could; however, some of the laudatory quotes made by these musicians may be spurious, such as one alleged quote from Wilhelmj saying that George’s violins were superior to old Italian instruments. In 1857 George married Anna Kieser from Baden, Germany, with whom he had 11 children who grew to adulthood. In 1859 his brothers left Springfield and joined his already growing workshop in New York. But by 1864 George and August had fallen out and in 1865 August opened his own shop in New York, claiming to be the ‘real’ Gemünder. In the same year Albert moved to Columbus, Ohio, where he continued to build organs for the rest of his life. By the early 1870s George, who was doing quite well, bought a farm in Astoria and commuted to his shop in New York until 1874, when he moved his shop to Astoria as well. This left New York to August, who in 1890 changed his firm’s name to August Gemünder & Sons to incorporate his sons, August Martin (1862–1928), Rudolf (1865–1916) and Oscar (1872–1946). August Martin was an influential musician and from 1892 wrote and edited Violin World, a periodical promoting his father’s shop with great success. Three of George Gemünder’s sons (George Jr, Hermann Ludwig and Otto) worked in his shop for varying amounts of time. The best maker of this generation of the family was George Jr (1858–1915), who was working with his father by the 1870s. His violins show many characteristics of his father’s style, though they are not quite as rich or elegant. George Gemünder had a serious stroke in 1889. Although he was unable to work after this, George Jr and Francis Elmer Davenport continued to make violins in George Sr’s name until he died in 1899. In 1886 George Jr had opened a Manhattan branch called George Gemünder & Sons in Union Square to reclaim a presence in the big city, but the expense of caring for George Sr after his stroke left the family near-bankruptcy by 1899 and although Hermann Ludwig and George Jr continued to make violins after this date, they both died penniless. When August died in 1895, his sons August Martin and Rudolph continued the firm of August Gemünder & Sons. 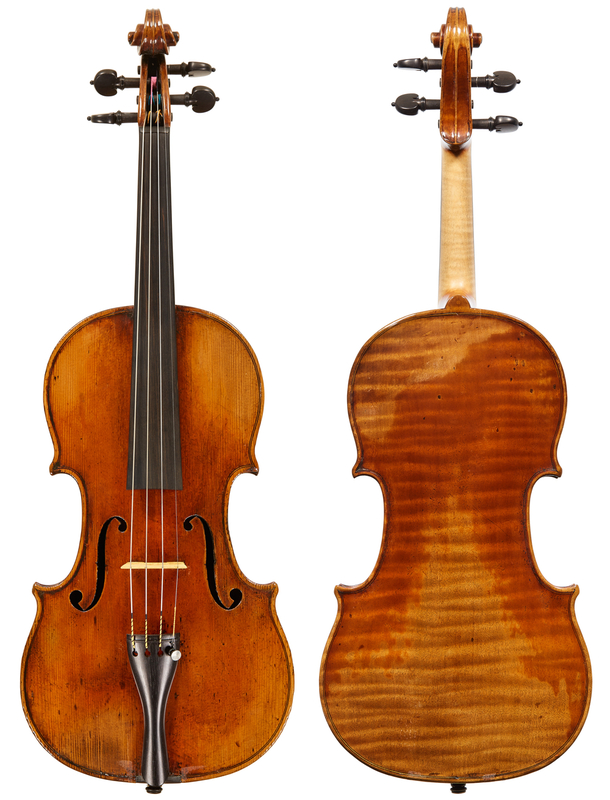 Without their father’s instruments to sell, they started to stock violins imported from France and Germany, which they labeled ‘August Gemünder and Sons’ or ‘Gemünder Art’ violins. During the First World War it became impossible to import violins from Europe, so they sold Gemünder Art violins that were made in Japan. They also sold bows, mostly from good German makers, and continued their father’s tradition of doing repairs and trading in old instruments. After Rudolph died in 1916, August Martin continued running the shop and publishing its house periodical until his death in 1928. 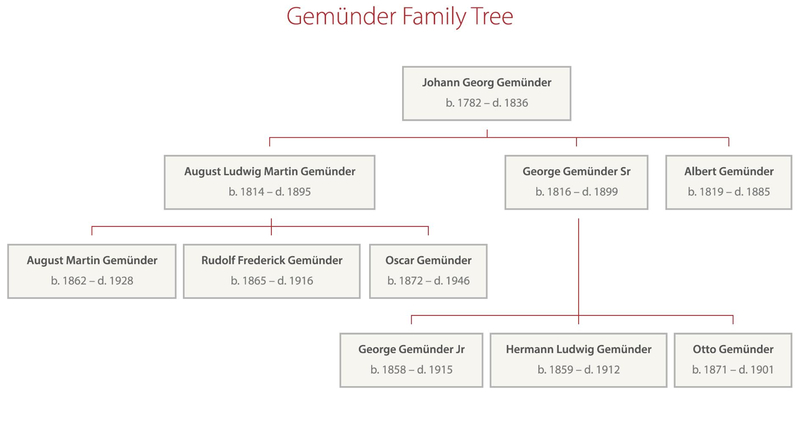 There was an inter-family lawsuit in 1916 brought by Rudolph’s widow, who wanted the August Gemünder firm to dissolve the company so that she could have her late husband’s share to live on. The suit was settled, but the costs weakened the firm. Yet despite this, and some excellent competition from a new wave of American violin makers trained in Europe, the shop remained active. After August Martin’s death in 1928, the enterprise was run by Oscar Gemünder, who may have made some of the ‘Gemünder Art’ violins. It finally closed when Oscar died in 1946. There is no doubt today that George’s violins were superior to August’s. August’s violins are fine examples of German craftsmanship, but he adopted none of the nuances that his brother had acquired in France. However, August’s publicity was superior to that of George, who was also cut off from much of the New York trade after his move to Astoria, and after their deaths there was much confusion about who had accomplished what, and who was the better maker and the ‘real’ Gemünder. 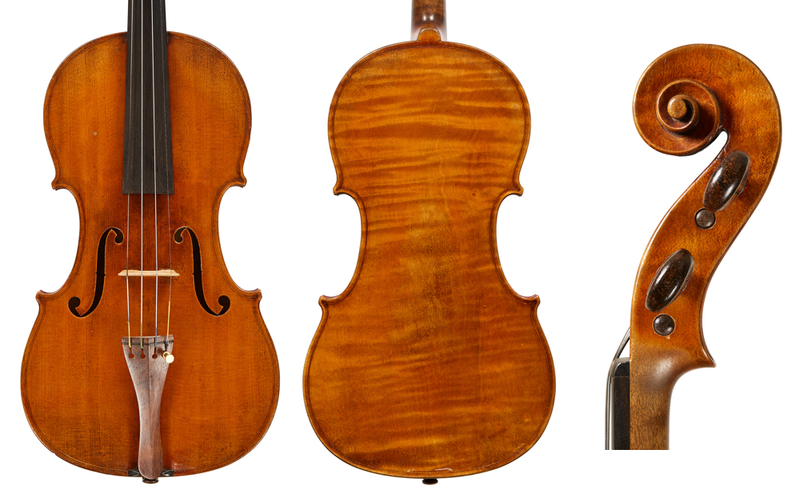 Not all of the violins made in George Gemünder’s shop during his lifetime were of equal quality. Some were plainly workshop violins that sold for a lower price and look like pedestrian German productions of the day, although they were made in Astoria, Long Island. The best of George Gemünder’s violins, however, have much of J.B. Vuillaume in them and deserve to be ranked with the very finest of the alumni of that illustrious shop. David Bromberg is a specialist in American violin making and runs a violin shop in Delaware. – Philip J. Kass, The Gemünder Family of Violin Makers, Journal of the Violin Society of America, No.6 (3), 1983. – George Gemünder, George Gemünder’s Progress in Violin Making, Astoria, New York 1881. – Tucker Kent Densley, Christopher Germain, Philip J. Kass and John Montgomery, The American Violin (New York chapter), The American Federation of Violin and Bow Makers, 2016.